Medical tourism: an ever-growing sector! The numbers speak for themselves: in 2007, 7.5 million people traveled to seek treatment abroad. They were 16 million in 2012. For the upcoming 10 years (2015-2025), a 25% growth per year is expected. This is what a study, published in 2014 by Visa and Oxford Economics (Mapping the Future of Global Travel and Tourism) assures. 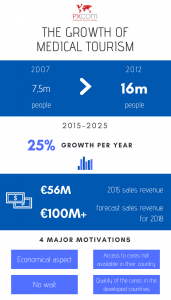 This booming new type of tourism generates a sales revenue that is the stuff dreams are made of = more than €56 billion in 2015. If Visa and Oxford Economics forecasts are accurate, it should exceed €100 billion in 2018. This worldwide phenomenon is such the famous professional salon ITB in Berlin give it a space since its 2017 edition. Cares that are involved: mostly dental care, plastic surgery and reproductive medicine, but also ocular medicine, cancer or heart treatments, rehabilitation, preventive tests. But what pushes these medical tourists to seek treatment far away from their home? No wait: for example in the United States or the United Kingdom, for non-vital plastic surgeries, the waiting lists are extremely long. For the cares quality: the upper classes from the developing countries frequently seek treatment in developed countries, especially in Europe, to benefit from good quality cares. This is the case for more and more Russians, Brazilians and Chinese. When Arabic citizens prefer Dubai. It is therefore amusing to see there is a real back-and-forth in the medical tourists flows — the upper classes from developed countries, seeking abroad for cheaper treatments, crossing paths with upper classes from the developing countries in the airports, seeking for higher-end cares. Medical tourism is not just a godsend for hospitals and clinics, even if they are the direct beneficiaries. All the ecosystem around can also take advantage of it. That’s why our tourism players are well advised to also surf this wave, which was under exploited until now. For example, by getting closer to advanced English clinics to offer foreign moneyed patients some luxurious activities. Maybe a pack with guided visit of the city with a personal shopper, a meal in a great restaurant and an evening at the opera! The motivation for the English citizens seeking for cheaper treatments abroad is the economy. For them, packs with hotel, car hire, cultural activities close to health centres from foreign big cities — such as Casablanca — at a very competitive price, will be enticing for sure. This new medical tourism offers another godsend, which affects the lawyers. Indeed, seeking treatment abroad is not always safe. The rules in terms of cares and surgical operations are not as strict as in England. A fail may happen anytime! 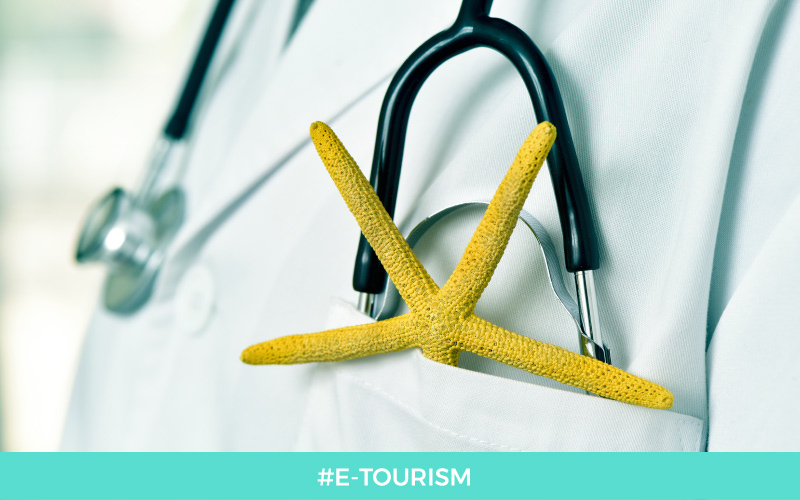 Looking for inspiration to have a creative medical marketing strategy bound for tourists? Find the health experts place in our article about medical tourism!